"We’ve had a long association with Capital Equipment Hire going back at least 12 years. Their extensive product knowledge and excellent service has made them an incomparable business partner. They complement our needs and are always available to provide knowledge and advice, so we supply the correct machine to our customers"
"Our business is a constant cycle of cleaning and maintenance. The cleaning equipment that Capital Equipment Hire provides us with is reliable, cost effective and best quality. They genuinely take the time to assist us with tooling up per site and making sure that we have all the support we need in the challenging construction cleaning environment"
Capital Equipment Hire is dedicated in being the leading cleaning equipment solutions provider within Australia. Delivering unrivalled value to our customers since 2004, we partner with commercial and industrial businesses to supply cost effective solutions to maintain a clean and safe working environment. A family owned business with the focus of exceeding our customer’s expectations, we continue to work closely with our clients ever changing needs, providing the latest technology to gain the most cost-effective cleaning solution in a professional and personal manner. Our valued clients are from diverse industries including warehousing, transport, pharmaceutical, automotive, construction, hospitality and cleaning contractors to name a handful. We see each new customer as a chance to build long term mutually satisfying business relationships, sharing our wealth of knowledge in providing cost-effective solutions to their individual cleaning challenges. Capital Equipment Hire has an extensive range of professional cleaning equipment from selected international brands that are available for purchase or hire; hire from 1 day to 60 months. An industry-leading supplier of floor cleaning equipment utilising years of industry experience, with an extensive range of new and used models readily available. We provide commercial and industrial floor sweeper hire, as well as commercial and industrial floor scrubber hire to ensure we offer the most complete floor cleaning machine hire fleet in Sydney. Our range offers walk behind floor sweepers and ride on sweepers - suitable as commercial sweepers, industrial sweepers, car park sweepers, warehouse sweepers and more. Our variety of walk behind scrubbers and ride on scrubbing machines cater to a wide range of commercial and industrial tasks, and our combination sweeper/scrubbers are available for highly efficient large area cleaning. We're a premier provider of cold and hot water pressure washers, commercial and industrial vacuums, and specialised bespoke vacuum system requirements. Browse our online shop to view our entire range of new equipment. Our affordable selection of approved second-hand equipment offers solutions for all budgets and are available with warranty for piece of mind. Visit our used page to see what second hand equipment is currently available. We understand the importance of quick response times and pride ourselves on effective service programs to optimise your machine's success. Our new state of the art workshop facilities are designed to conduct major repairs or refurbishment of your cleaning equipment in a cost-effective method providing value for your investment. Our experienced factory trained service technicians and mobile service vehicles are utilised to complete efficient on-site periodic maintenance and repairs. Parts are kept readily available thanks to our custom ERP monitoring system, allowing fast dispatch to ensure your machine continues performing at its highest level. We have an extensive range of genuine replacement parts available and are continually refining our stock levels to meet our customers' ever-changing demands. We also source and test non-genuine substitutes to OEM components to offer lower cost alternatives, providing they offer value and meet our strict quality control procedures. 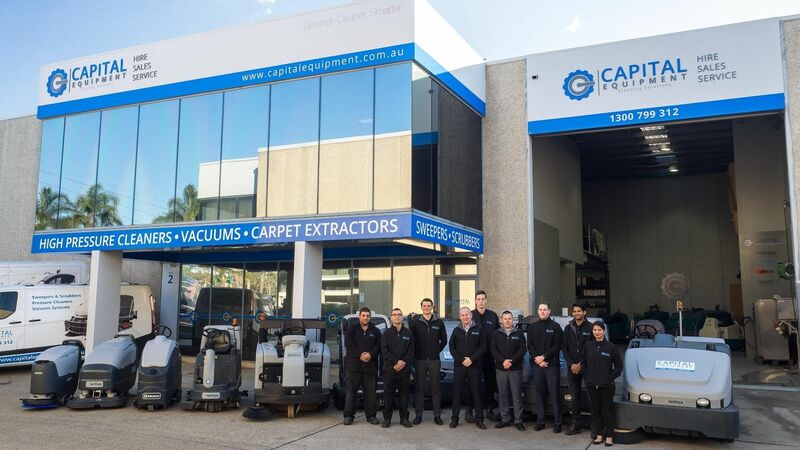 For the total management of service and repairs of your sweeper, scrubber dryer, combination sweeper/scrubber dryer, carpet care equipment, commercial or industrial vacuum or vacuum system and high-pressure washer machines, contact our friendly service team on 1300 799 312 or service@capitalequipment.com.au.